One of the most difficult tasks when it comes to organizing the home is talking about it with other family members. It’s far too easy for conversations to deteriorate into arguments and suggestions about clutter to turn into accusations and attacks. In the end, the one wanting to unclutter becomes extreme wanting to throw everything out and the one resisting begins to hold onto to every little piece of paper saying that it’s all vitally important. 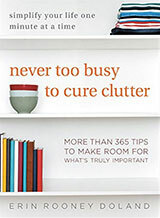 No one’s happy and the clutter problem isn’t just still there, it’s grown into the focus of a battle of wills that can’t be won. Fortunately, there exists a solution, and it comes in book format. 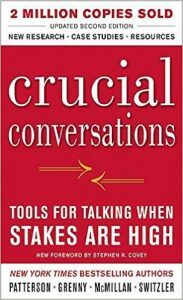 Crucial Conversations: Tools for Talking When Stakes are High, 2nd Edition, is a book that helps people to prepare for delicate conversations, to transform anger and hurt feelings into dialogue, and to make any situation safe enough for all parties to freely discuss any topic. My background is Anglo-Canadian, and so I come from a culture where delicate conversations were never held. I never learned how to initiate and participate in (possibly) anger-producing discussions; we would just avoid them. So, for me, finding this book has been a lifesaver both at work and at home. Ch 1: What is a Crucial Conversation? And Who Cares? At the beginning of the book, there is a quiz to help you determine what challenges you face in particular when it comes to the issue, and suggests which chapters should receive your special attention. Well, at work, I have to evaluate staff and sometimes provide feedback that no one wants to hear about themselves. Previously, I would have softened the message so much that no one was ever sure I was critiquing them. Now, however, I have a framework to use that doesn’t attack the listener, but allows me to express my concerns about their job performance. And at home, instead of never saying anything because I did not want to upset my partner, I can now open up and create a safe space for discussing pretty much anything. 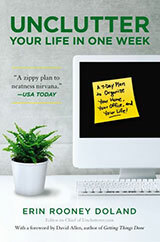 If I had read this book back when I was organizing professionally, it would have helped my business immensely. Often organizing clients feel ashamed or attacked when anyone speaks to them about their clutter and conversations slide into defensive, emotionally-charged situations. When family members are involved, these conversations can become full-blown arguments. In my opinion, this book should be required reading for everyone, but most definitely it needs to be read by anyone who finds that delicate conversations either don’t happen or become arguments that harm their relationships when the goal is only to help those around them. Crucial Conversations is available in print or in e-book and has a follow-up title called Crucial Accountability (previously titled Crucial Confrontations), also available in print or e-book (I have not read this latter book yet, but if it’s anywhere as useful as the first book, it’s a must-read as well). And if you like your books bundled, the two come as an e-bundle offer, as well. Thanks for this recommendation. I’ve heard good things about this book in the past, but haven’t yet read it. You’ve just inspired me to put it on my to-do list!